The Inn at 410 interiors have been professionally designed and continually updated since it's opening in 1991. 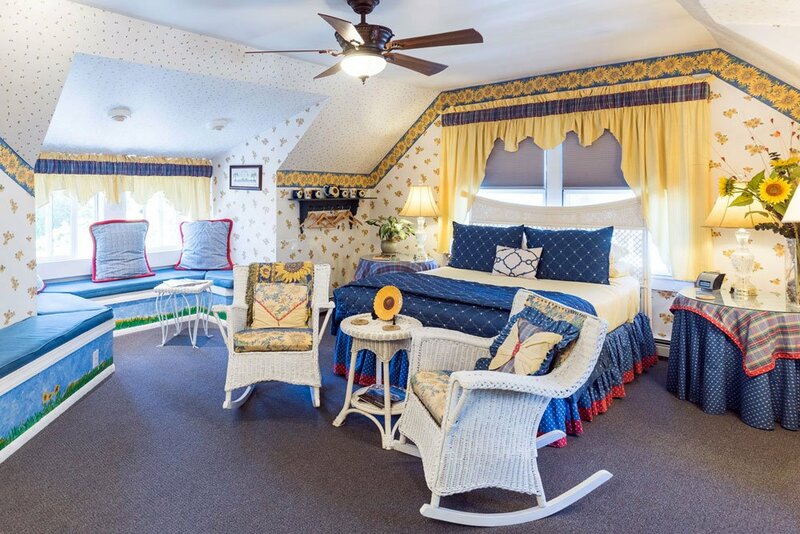 The Inn's main building contains almost 5,500 sq feet of living space with 8 guest rooms while the adjacent 2,000 sq feet building contains Monet's Garden and the Observatory Suite. The Inn at 410 offers ten distinctive guest rooms and suites, all with private bath, fireplace, mini-fridge, coffeemaker with Wolfgang Puck ground coffee, Wireless Internet, Flat-Screen TV with Cable, DVD players with movie library, iHome clock radio, iron and ironing board, individual heat controls, and Mitsubishi quiet air conditioners along with ceiling or window fans. Our beds are triple-sheeted with down blankets, pillowtop mattresses and feather or comfort fill pillows. All guest Ensuite Bathrooms offer tub/shower combinations, Vera Wang Turkish bath towels, bathrobes, hairdryers, Gilchrist & Soames oatmeal bath soap and a moisturizing skin care bar, shampoo, conditioner and body lotion, shower caps, makeup remover, and cotton balls. All guests can enjoy our afternoon refreshments including homemade cookies, trail mix, hot cider or lemonade, and a generous complimentary bar while a full gourmet breakfast is served in our dining room from 7:30–8:30/9 a.m. Sorry, no pets allowed. Book early to get your room choice. In-season weekends always fill quickly! Rates listed vary weekday to weekend and by season. 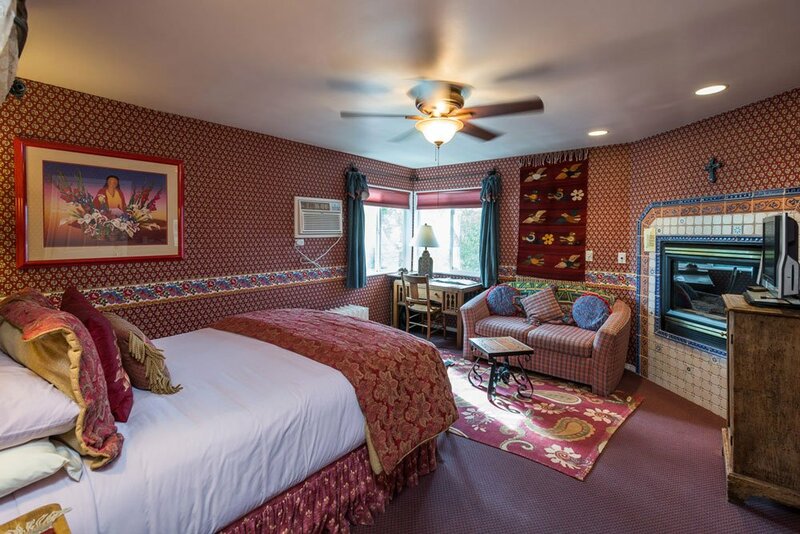 Get $10 off per night May 1-Oct 31 when you book direct with us! Write "Save10" in the Dietary Restriction Space on your reservation. Discount must be requested at the time of reservation only. 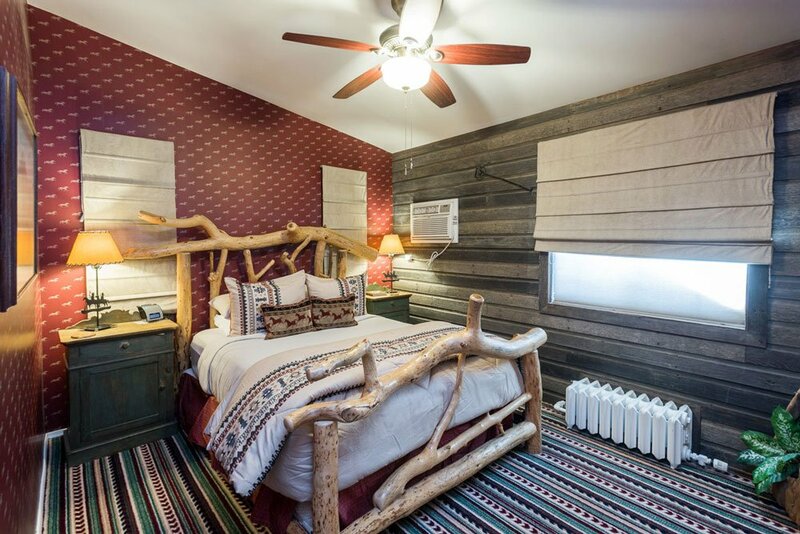 A tranquil two-room suite with regional Native American arts and crafts. 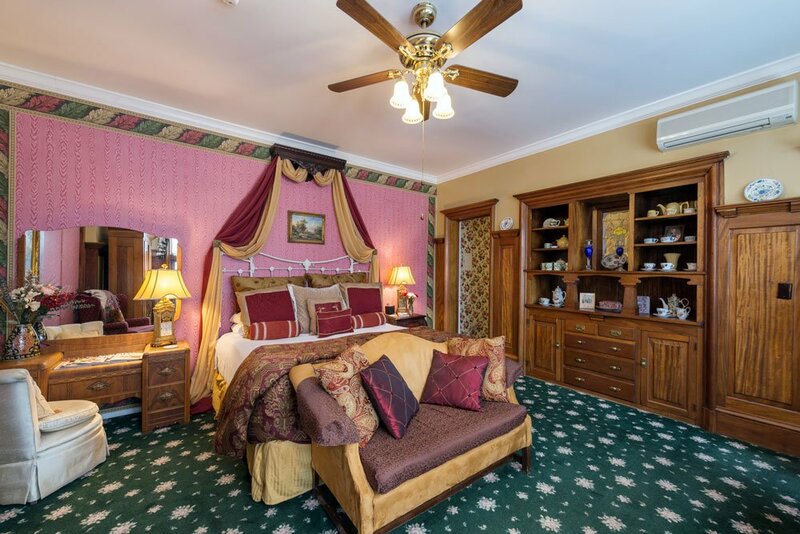 Luxurious King-size bed with pillow-top mattress and kiva-type gas fireplace. Ensuite Bathroom with tub/shower combination and grab bar; the original master bedroom of the 1894 house on the first floor. Limited ADA access. Reading and seating area in the enclosed porch through the French doors and a two-person jetted tub. An elegant ground-floor "Victorian" suite "the original 1894 dining room to the estate" with mahogany woodwork throughout. 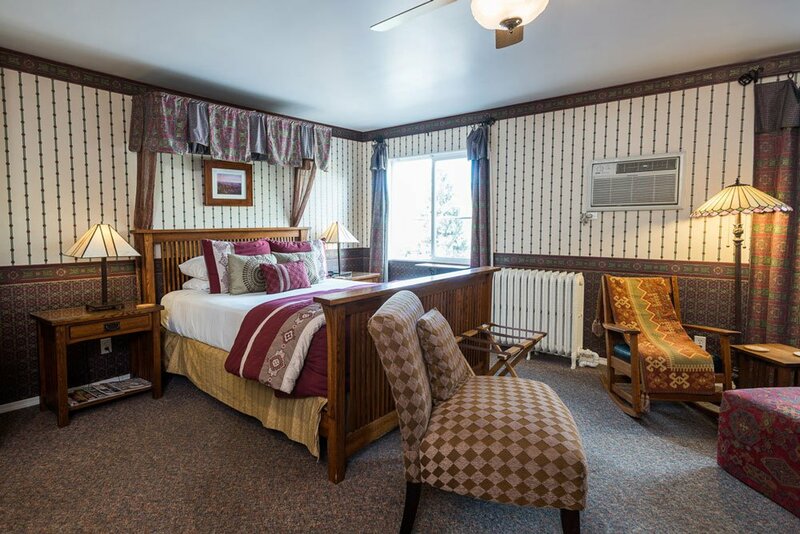 King-size bed and separate dressing area, with a romantic, jetted tub for two, Large Ensuite Bathroom with a tub/shower with grab bar and a fireplace on the first floor. No ADA access. A colorful, romantic Jacuzzi suite impressionistic of a French country garden. King-size bed, fireplace, love seat, jetted tub for two, and walk-in shower for two in the Ensuite Bathroom, ground level room. A private porch overlooks our garden patio. This suite is ADA accessible with a ramped entryway, roll-in shower with grab bar, 17-inch high toilet with grab bar, however, there is no roll-under sink. The Inn at 410 is not required to be ADA compliant as a private historic home. The Old West at its best. Weathered South Dakota barn wood, queen-size log bed with separate sitting room with fireplace, TV/DVD player for movies, a twin bed and double futon bed for up to two adults or children over 8 years, Ensuite Bathroom 2nd-floor suite with no ADA access. Accommodates up to 4 guests. $25 additional charge per person over double occupancy. "Turn of the century" romance inspired by the music of the Masters, dedicated to Beethoven. 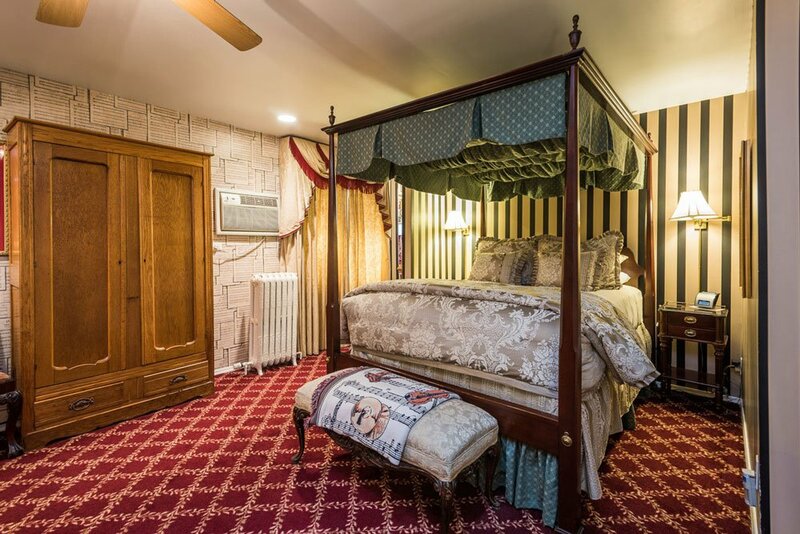 Queen-size canopied bed, antique secretary, love seat in front of the fireplace, Ensuite Bathroom with tub/shower, No ADA access, 2nd-floor room. As light and airy as our many fields of summer sunflowers. 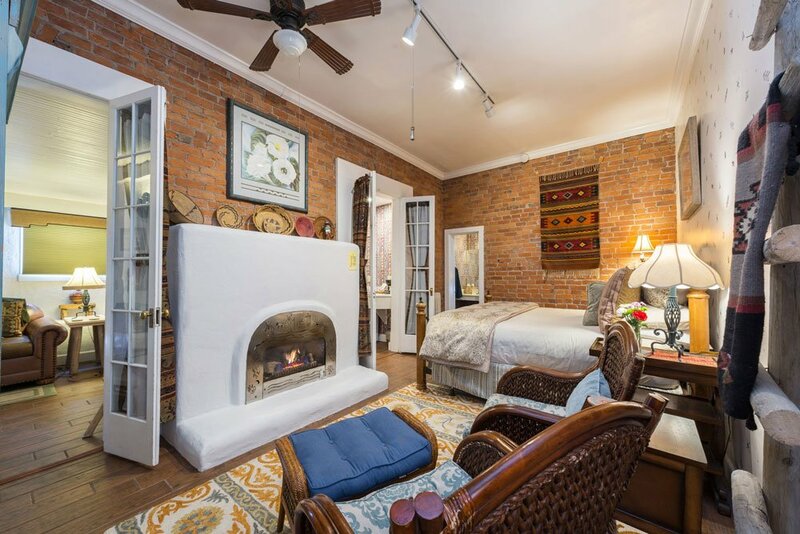 Queen-size bed, antique wicker rockers, Ensuite Bathroom with tub/shower, fireplace with window seat overlooking our neighborhood, once known as the "Nob Hill" of Flagstaff—2nd-floor room. No ADA access. Arts and Crafts decor reminiscent of historic southwest U.S. travels. 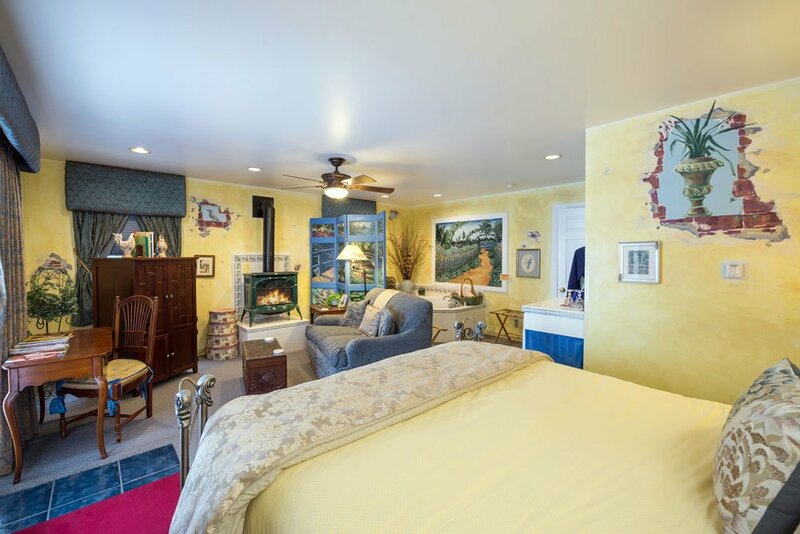 Queen-size bed, antique rocking chairs, Ensuite Bathroom with a tub/shower, a mural of the Grand Canyon over the fireplace, great view of the San Francisco peaks, 2nd-floor room. No ADA access. 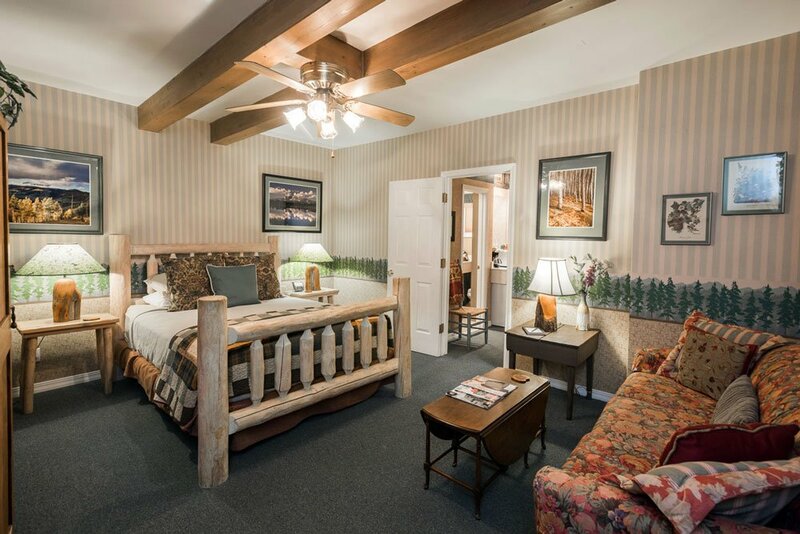 Dedicated to the natural beauty of the San Francisco Peaks this retreat is a "natural" for couples or up to 3 people. Queen-size bleached-log bed and full sofa in the master bedroom with electric fireplace and TV with DVD player for movies; separate parlor with full-sized futon sofa for an additional adult or child over 8 years of age, additional TV with Cable and your own patio, Ensuite Bathroom with grab bar, ground floor suite. Accommodates up to 3 guests. $25 additional for each person over double occupancy. Limited ADA access. Our coziest and most colorful room with influences of Old Mexico. Queen-size wrought iron bed draped in Spanish lace, Ensuite Bathroom with tub/shower, Mexican tiled fireplace and Zapotec rug. Tree-top view of the Nativity Church tower and historic downtown—2nd-floor room. No ADA access. Dedicated to Northern Arizona’s night sky, this contemporary 1,000 square foot 2 bedroom, one bath suite is filled with professional astrophotography. Large bathroom with a walk-in shower w/ two shower heads, double pedestal sinks, skylight. 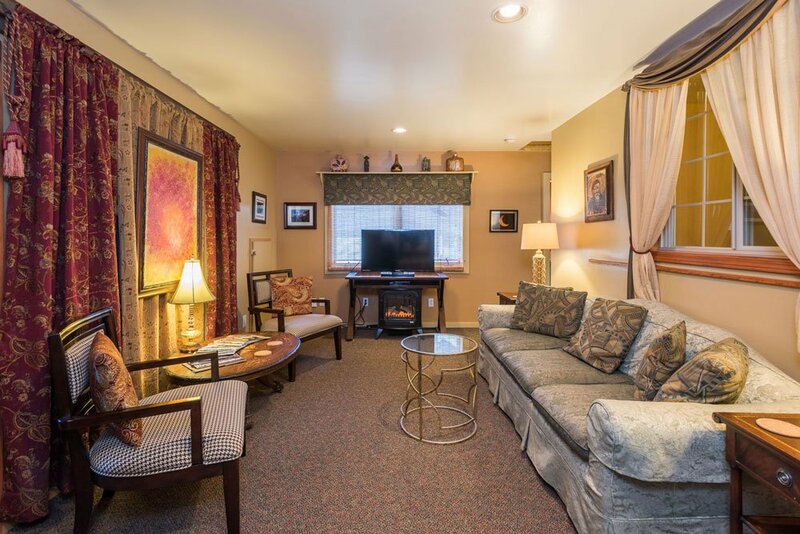 Observatory Suite is the perfect location for a long-term stay in walking distance to historic downtown Flagstaff. This suite also offers a kitchen and large living area. Suitable for two couples or a family of four. Also available for small meetings of up to 10–12 people. No ADA access.